Making candy has never been easier. 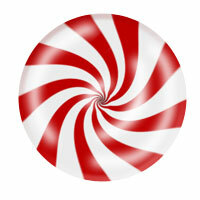 Even if you are a beginner at Adobe Photoshop you should be able to create candy just like the image shown below. If you are an intermediate level photoshop user you might find this tutorial a little long winded, so read through it first, that way you’ll know the areas that you can fly through. You can use your candy to decorate photos, scrapbooking or make great Christmas cards. Hopefully you will learn a few new tricks with photoshop too! Note that the keyboard short-cuts shown are for PC (because that’s what I use). 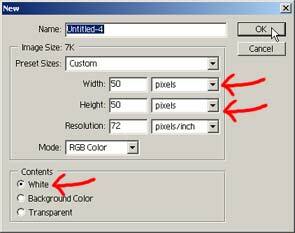 Create a new square canvas with a size of 50 x 50 pixels. Ctrl + N creates a new canvas. 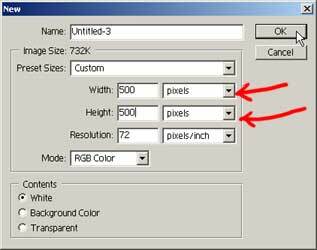 Ensure your settings are the same as shown in the image below and click OK. Select the Rectangular Marquee Tool from your tool box. Shown below. Click and drag the marquee tool over your canvas to create a selection like the one shown in the image below. (For those obsessed with EXACTS, mine is 23 pixels wide and is definitely off centre). Click on your foreground colour in your tool box. The Colour Picker box will appear. 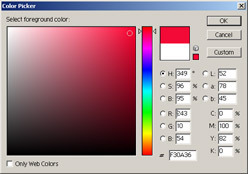 Select a bright red colour and click OK.
Now click on your Paint Bucket Tool in your tool box. With your paint bucket click on your canvas and fill the selection red. See Below. Get rid of the selection (deselect). Click on your Edit menu. 3/4 of the way down the Edit menu you will find Define Pattern… Click on it. The Pattern Name box will appear. Rename it and click OK.
You have now defined a pattern. Create a new canvas this time with the size 500 x 500 pixels. Go to your “Layers” palette and create a new layer ( ). 1. Change Fill from foreground to Pattern. 2. 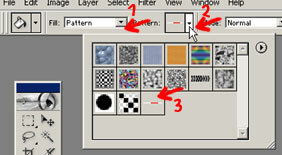 Click on the pattern arrow to reveal the pattern options. 3. Select your new candy stripe pattern. Now click on your canvas to fill it with stripes. You’ve now created a star burst. 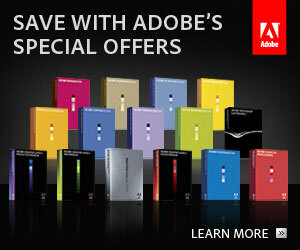 Now is a good time to Save (Ctrl + S) your work.